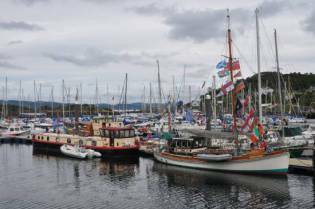 Last year’s Tarbert Traditional Boat Festival was a fantastic advertisement for Tarbert. With some 30 traditional boats from across Scotland and Ireland and an exciting programme, the event attracted a huge number of delighted visitors from across Kintyre and Mid-Argyll, as well as a large number of additional visiting boats. 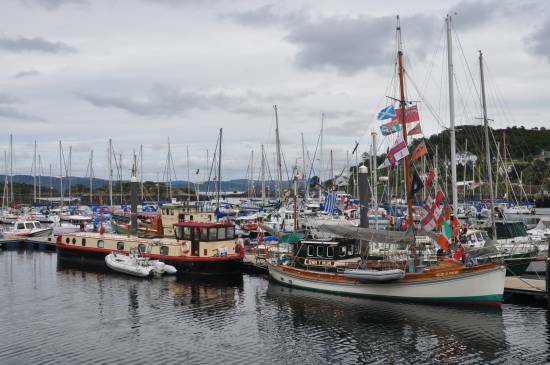 This was the re-launch of Tarbert’s traditional boat festival and will certainly not be the last. With all traditional boats being visible from the new main pontoon, villagers and visitors could enjoy the spectacle from the walkway around the harbour. Many also took the time to visit and admire the new pontoons and step on board the wide variety of traditional sailing and motor boats, which included the Morna, built in 1920 at Dickies of Tarbert. The variety of shore-side stalls were a sell-out success, including wood-working and boat-building from Galgael, RNLI/MCA, locally-made produce and Springbank distillery. Also hugely popular were the skiff races, with skiffs provided by Ardrishaig and Tarbert yacht clubs. And the family atmosphere was completed with young and old alike competing in the fun Springbank greasy pole event: a clamber along a greasy pole to retrieve a bottle of Springbank whisky. Luckily, the warm sunshine meant that none of the contestants minded the almost inevitable drop into the waters around Jakes Quay, with only a couple of participants managing the slow and slippery crawl to retrieve the whisky. Traditional music was also a feature of the weekend with live music on the pontoons on Friday night and the Erich Ceilidh Band keeping everyone dancing until the small hours on Saturday night/Sunday morning. Festival goers and participants really enjoyed the whole weekend: ‘It was the best organised festival I’ve ever attended’ enthused one participant, with many saying, ‘We’ll definitely be back next year and will tell others about the event’. The festival was also well-received in the village, with shop owners delighted with the brisk business throughout the weekend. The organisers would like to extend their sincere thanks to all those who helped to make the festival such a success. Special thanks also to Tarbert Hotel for running the Saturday night bar and providing free breakfasts for all participants on the Sunday morning, Springbank Whisky for sponsoring the greasy pole event, the Café Barge and Jura Whisky for providing the opening reception and Tarbert Harbour Authority for reduced berthing rates for participants and free use of harbour-side facilities.